You are the Queen of Collections, Tabatha. I will be pouring over both of these, but especially taking my time with the imaginary poems to relish each one. (Delighted to see so many of your own poems featured on the list!) Thank you for being today's Poetry Friday roundup goddess as well. So sorry to hear about the blog roll fiasco-- what a nuisance. But thanks for including me. :) I WILL get around to doing this myself one of these days! Thanks for hosting us today, Tabatha. And thanks for sharing your collection of imaginary place poems, filled with so many of my Poetry Friday friends' poems! Hi, Tabatha. Jabberwocky is an all-time favorite at our household. Anyway, today I'm sharing two things: a short interview I posted earlier this week with crime poetry editor/poet Gerald So (http://mattforrest.wordpress.com/2014/04/23/national-poetry-month-catching-up-with-crime-poetry-editor-gerald-so/) and today's Poetry Friday is a first for me - I'm posting a poem I did not write! It arrived unexpectedly in the mail yesterday (http://mattforrest.wordpress.com/2014/04/25/poetry-friday-the-poetry-of-vladimir-k/) and I had to share it! Tabatha, this has been a great month visiting imaginary places! Tabatha, as always, there's an embarrassment of riches here at your hangout. Thanks so much for hosting us today! Thanks for hosting, Tabatha. I can see that I will be spending some time visiting imaginary places in the morning! Thanks for hosting today, Tabatha! I am interested in joining the summer poem swap. Not sure how it goes, but I'm willing to give it a whirl. Today for Poetry Friday I have a Villanelle called "the giVer riVer". Yes, those caps are in the right place - it is all about the letter V today! As Violet noted, "an embarrassment of riches!" Thank you for everything you do. And I'd love to swap this summer! Thanks for hosting today as well - I'm in with a Happy 450th BDay to the Bard (it was Wed.), and his Sonnet 98. Tabatha! Thank you so much for being our gracious host this week. 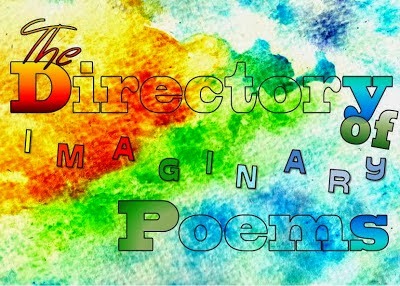 Your directory of imaginary poems is such a buffet of magical words that feed the soul. I have the silenced voice of Tula or La Peregrina (The Wanderer) for Poetry Friday at GatheringBooks today as I share Margarita Engle's "The Lightning Dreamer" which is based on the life story narrative of Gertrudis Gómez de Avellaneda, Cuba's Greatest Abolitionist. Excited to post my first Poetry Friday post. So intrigued to visit imaginary places! (wish I found this sooner). Thank you for hosting! I'm up today with poems by Julie Larios and George Ella Lyon. Please include me in the summer poem swap! Thank you, Tabatha, for hosting with all things imaginary and all Poetry Friday things real! Much fun to your son this weekend. At The Poem Farm, I have Poem #25 in the Thrift Store series, "Duck and Doll" - a free verse poem about friendship. I love the imaginary place poems! I clicked through a few and saved the list for later - fabulous! My NPM journey takes me close to home today, with poems by my kindergarteners! Tabatha--Thank you for hosting and for inspiring so much poetry. I'm still working on my poem a day project for April. This week I've posted poems about the mailbox, the sidewalk, the earth, and one reason the outside world is a refuge for me. Here's the link to yesterday's poem. I haven't written today's poem yet! Thank you for the list--I'm looking forward to reading the poems! I've posted an original shape poem and tips for creating them at http://www.joannmacken.com/blog.htm?post=955103 I'm also giving away a copy of Write a Poem Step by Step. Good morning. Thanks for hosting! I have a blog post about a classroom visit I did and other nuggets of goodness at my blog which is called POETRY TIME. Thanks so much for hosting! You always do such a great job! I finally reviewed Irene Latham's book today, plus I have a poem my daughter wrote about me a few years ago. Happy Poetry Friday! I LOVE your collection of Imaginary Poems, Tabatha! I am going to have to spend some time here today. = ) My Poetry Friday post today celebrates the incredible Jack Prelutsky! I absolutely love The Dictionary of Imaginary Places. And what fun that history bee must be! Thanks for hosting, Tabatha, and I'm in this week with Faith Shearin. It's here. My selections is a story in concrete poetry: "Meow Ruff" by Joyce Sidman with illustrations by Michelle Berg. I'm in today with a poem about Gene Kelly. And here's my first Poetry Friday contribution, too. I recently learned about this weekly collection from the Two Writing Teachers blog. Thanks so much for hosting! Thanks for doing the roundup this week. Sorry to be so late submitting my poem. I've been babysitting my granddaughter while my daughter and son-in-law were away on vacation. I'm one tired grandma! At Wild Rose Reader, I have an original poem about the Megalodon--which I wrote as a definition of the prehistoric shark. How are the History Bees going, Tabatha? I've been and read a half-dozen of your own DIP poems--my favorites are the Hogwarts and the Gardener of Tanje ones, for very different reasons. I would love to see a published collection of these! Thanks for adding, Tabatha. Appreciated..
Good to see Lewis Carroll's The Hunting of the Snark in your list. And introducing poetry to children is good as well. How about using Henry Holiday's illustrations to learn seeing? "We have neglected the gift of comprehending things through our senses. concept is divorced from percept, and thought moves among abstractions. Our eyes have been reduced to instruments with which to identify and to measure; hence we suffer a paucity of ideas that can be expressed in images and in an incapacity to discover meaning in what we see. Naturally we feel lost in the presence of objects that make sense only to undeluted vision, and we seek refuge in the more familiar medium of words. [...] the inborn capacity to understand through the eyes has been put to sleep and must be reawakened."